Wondering how to stop swaddling your baby? With new AAP guidelines that urge parents to stop using a swaddle earlier than ever before, you may be wondering just how you’ll transition out of the swaddle. It can be a little tricky but there are a few proven strategies that you can use! Swaddling not only helps your baby sleep better, but it also helps them sleep longer by reducing wake-ups from their startle reflex. Amazingly, swaddling has also been shown to reduce babies’ anxiety levels! But, there comes a day when you will have to stop using a swaddle. Maybe it’s when they start rolling over from back to tummy, or when they start resisting the swaddle so much that it just basically stops working for you. Either way, rest assured that you will be able to transition out of the swaddle and your baby will continue to sleep well, even while unwrapped. Follow my tips below for a smooth transition from swaddle to sleep sack. Swaddling becomes a safety risk once your baby starts rolling over onto their tummy. 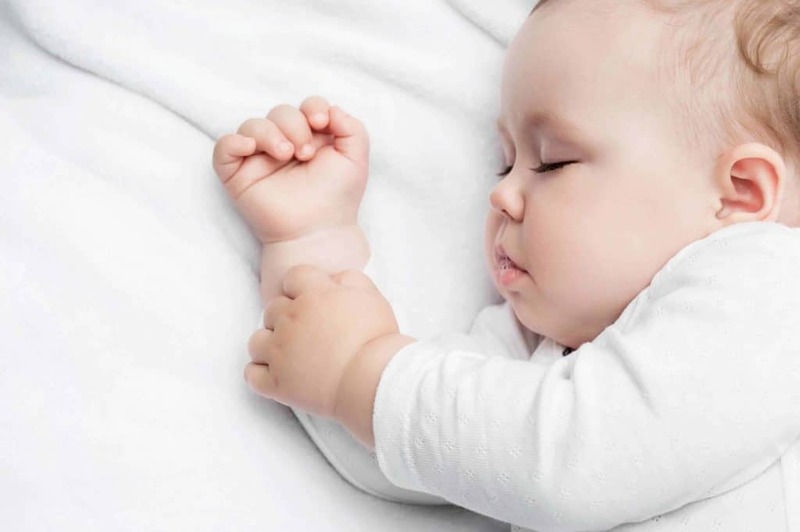 However, the American Academy of Pediatrics (AAP) recommends that parents stop swaddling their babies when they show signs of being able to turn over or onto their side. The AAP used to recommend that you stop swaddling around 3.5-4 months of age, but have changed the recommended age to as young as 8 weeks. For those of us that have had babies under the previous guidelines who were swaddled until 4+ months of age, 8 weeks feels pretty early to drop the swaddle. But in the name of safety, dropping the swaddle at this earlier age is a good rule of thumb. Another clue that it’s time to ditch the swaddle is when it no longer comforts your baby. If they’re spending more time trying to wiggle out of the swaddle, or if they don’t seem as comfortable in the swaddle, it may be a sign that they’re ready for something different. Change isn’t easy for anyone. And it’s important to remember that the younger the baby, the harder it is for them to communicate to us. A swaddle is a source of comfort for your baby; it’s something that makes being in the world feel a little more like being in the womb. When changing your baby’s sleep environment, I recommend approaching it gently and with sensitivity. Remember to be patient and know that it may take 2-3 days (or longer) for your baby to get used to their new sleep arrangement. For many families, transitioning out of the swaddle means transitioning to the crib. To make this transition easier for you and baby, I recommend having your baby nap in their crib once a day well before this point so that they’re used to sleeping in the crib. Transition your baby out of the swaddle gradually by leaving one arm out of the swaddle. By transitioning out of the swaddle more gradually, you can help your baby get used to being unswaddled. This process works best with a swaddle sack like the Halo. Swaddle your baby with one arm out of the swaddle. If your baby isn’t ready for this, you will know right away; in that case, simply try again in a week or two. After your baby is sleeping consistently, you can stop swaddling their belly and switch to a wearable blanket. Another way to do this would be to switch to an arms-only swaddle and keep your baby’s legs unswaddled. After using this for a couple of weeks, you would then leave one arm out of the swaddle (as suggested above). 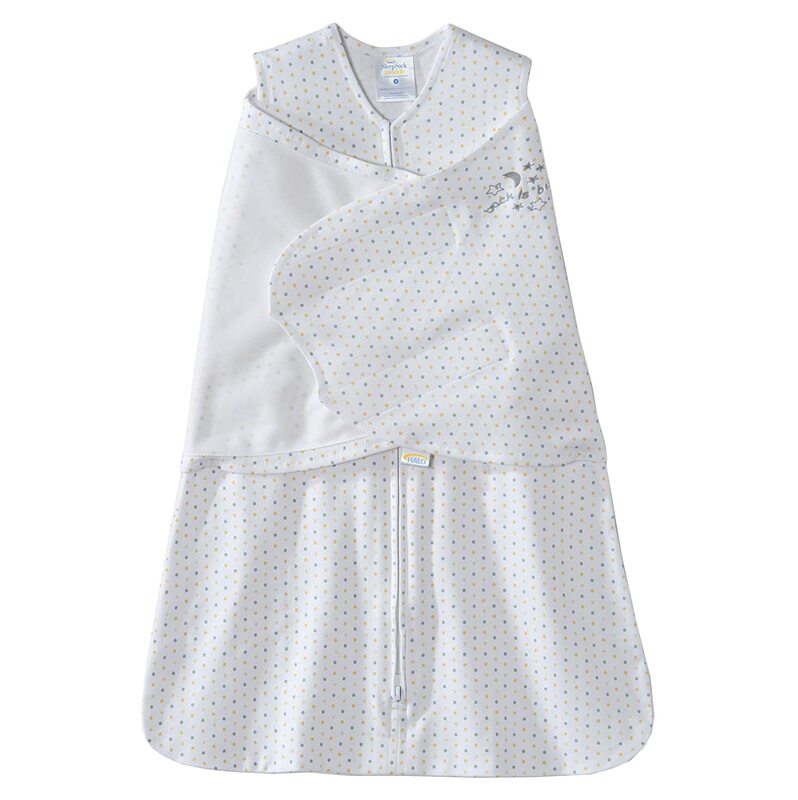 Swaddle transition suits are designed to continue to muffle your baby’s startle reflex. These suits can be very helpful in getting your baby accustomed to sleeping without the swaddle. You shouldn’t need to use these for more than a few weeks; after that point, you can switch to a wearable blanket. When it comes to finding a swaddle transition suit that works for you, it may require a little trial and error. Every baby is different and what works for one baby might not work for another. Be patient with this process. Also note that some of these suits can run a little warm, so you must make sure that baby won’t overheat in these. Don’t use these when your baby has a fever. 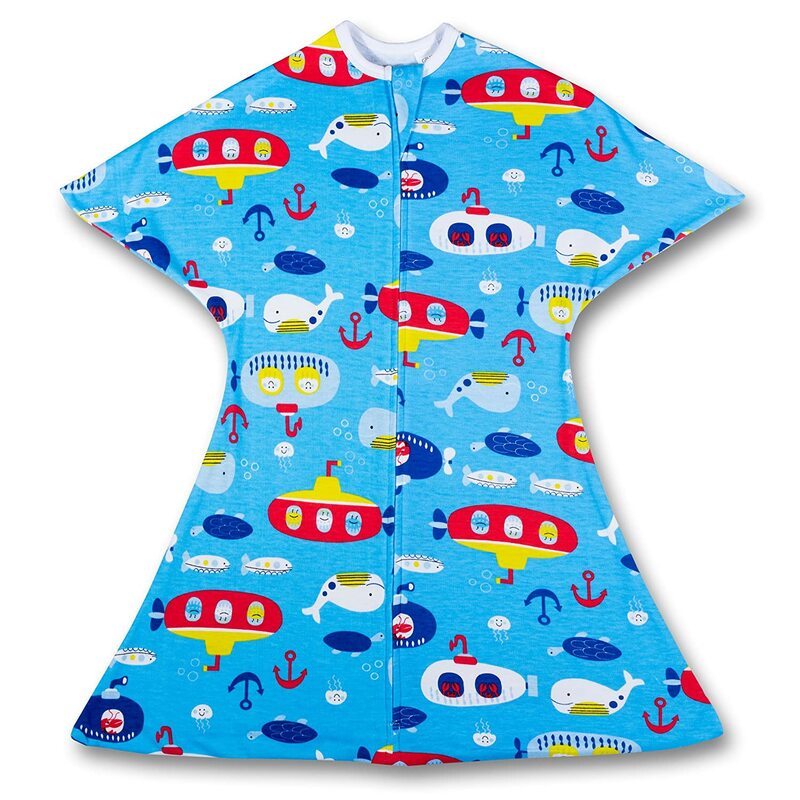 Talk to your pediatrician for sleepwear guidelines. Baby Merlin’s Magic Cotton Sleepsuit. The Baby Merlin’s Magic Cotton Sleepsuit is essential! Although it’s manufactured in China and isn’t organic, it is often hailed as a life-saver for parents whose babies have a hard time letting go of the comforts of the swaddle. Personally, both of my babies used this and I recommend it to all my friends. The Merlin suit offers babies the support and warmth of the swaddle but has open hands and feet to help with circulation. And, it still helps contain your baby’s startle reflex (which is one of the key benefits of swaddling), so it’ll usually allow baby to continue to sleep longer stretches once they’ve left the comforts of the swaddle and their bassinet (or Rock & Play). It’s a good idea to have one of these on hand, so you might want to register for this because it runs a little pricey. Since it’s not organic, you’ll just want to make sure to wash this well before use. If your little one sleeps well with the Merlin suit, keep an extra one on hand for when baby’s diaper leaks. It comes in cotton and microfleece, but for safety reasons I recommend choosing cotton, as synthetic fabrics such as fleece aren’t breathable and can therefore lead to overheating. (Fleece is made from polyester.) Please note that once your little one starts rolling over in the Merlin suit, it’s time to stop using it altogether. Halo Sleepsack. As mentioned before, the Halo Sleepsack is a 2-in-1 adjustable swaddle that grows with baby during and after the swaddling stage. During the swaddling stage, it serves as a wearable blanket that allows you to swaddle baby’s arms and contain the startle reflex. 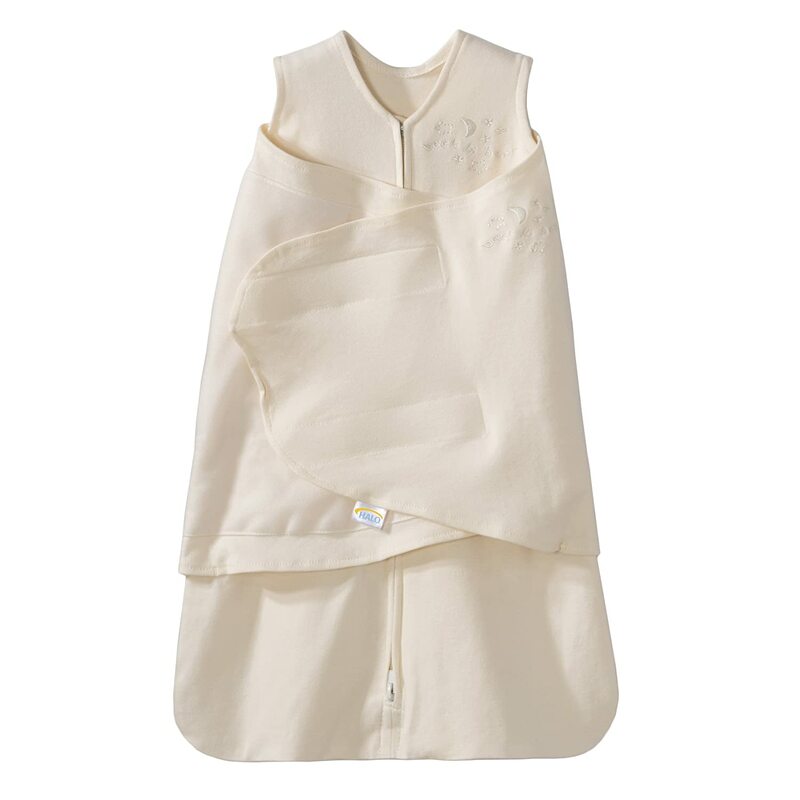 After baby can no longer be swaddled, the Halo Sleepsack can be used as a type of arms-out swaddle; this works well for babies because it fits snugly around their chest and tummy and gives them a feeling of comfort, or of being held. Zipadee-Zip. 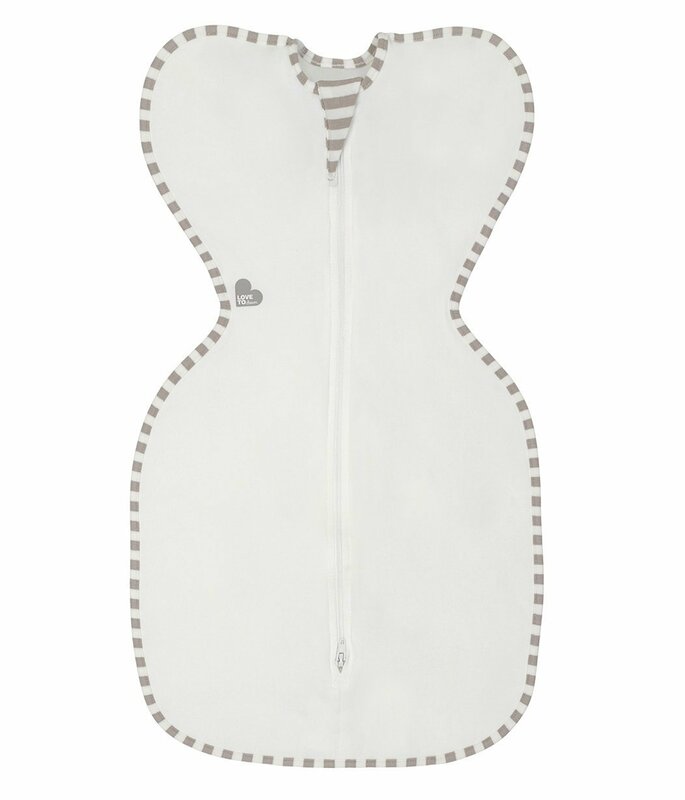 The Zipadee-Zip is a relatively new product that also aims to help parents with transitioning baby out of the swaddle. It is designed to help contain baby’s startle reflex and features star-shaped pointed sleeves that allow baby to move around freely in the crib while still making baby feel snug. The great news is that the Zipadee-Zip is not treated with chemicals because the company uses fabrics that are naturally flame-retardant (yay!). We tried out a Zipadee-Zip for a few weeks and while it helped, we didn’t find it to be an amazing, miracle sleep item. But this product has a huge following as well, and at the end of the day, it’s really about what works for you and your little one. It’s worth a try at the very least! Love to Dream Swaddle. For some families that didn’t have success with the Merlin suit or the Zipadee-zip, the Love to Dream Organic Swaddle has worked wonders. This product allows you to keep baby’s arms up (which many babies prefer) in a natural sleep position. 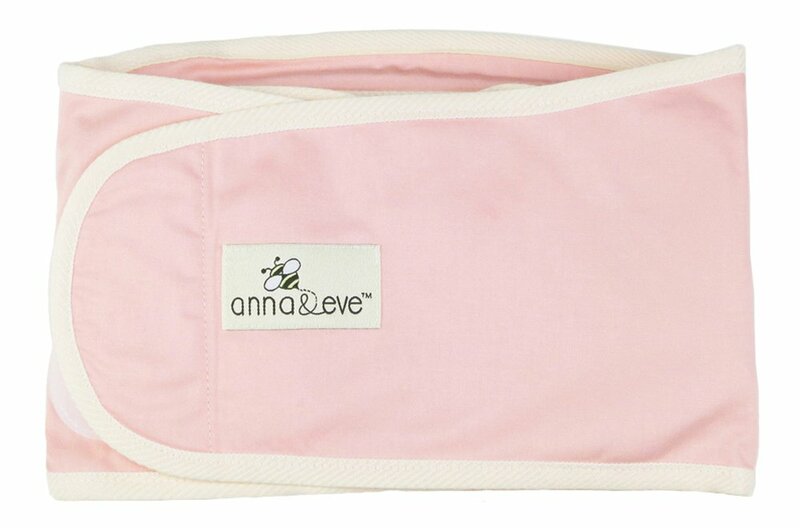 This swaddle is made from 95% GOTS-certified organic cotton and 5% elastane. A lot of the moms in my Facebook pregnancy due date group loved this swaddle. It didn’t work very well for us, but again, each baby is different. My baby just kept putting his hands in his mouth and ended up getting his hands drenched – to the point he couldn’t sleep. But some babies take really well to this. 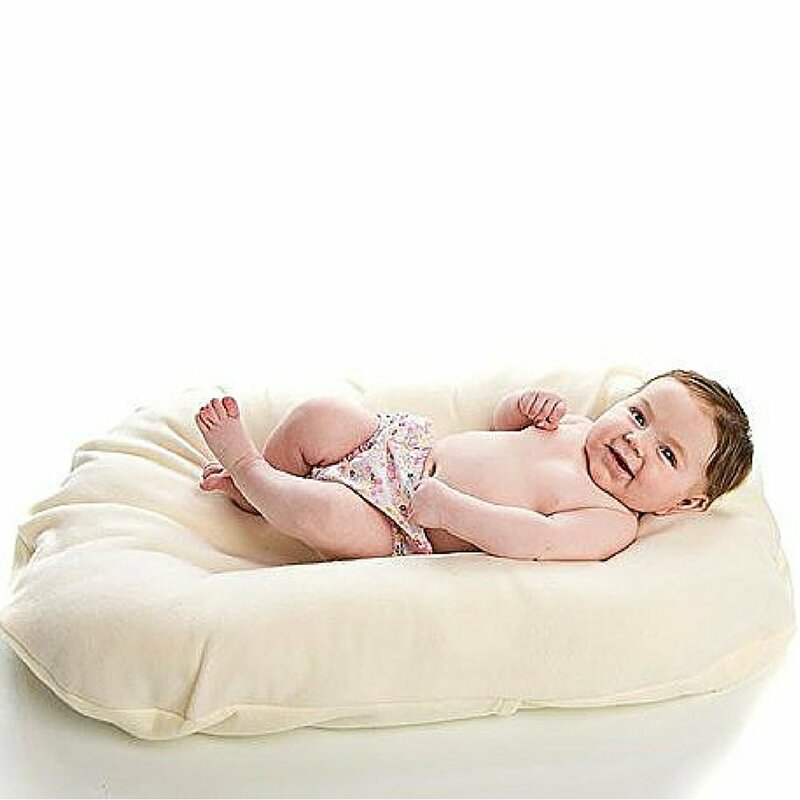 A sleep lounger like the Snuggle Me Organic or Dockatot helps provide a similar feeling of comfort to your baby, and can be very helpful in transitioning them to the crib. These can be a little controversial (and both manufacturers advise against using these in a crib) so ask your pediatrician if it is safe for you to use a sleep lounger in the crib. 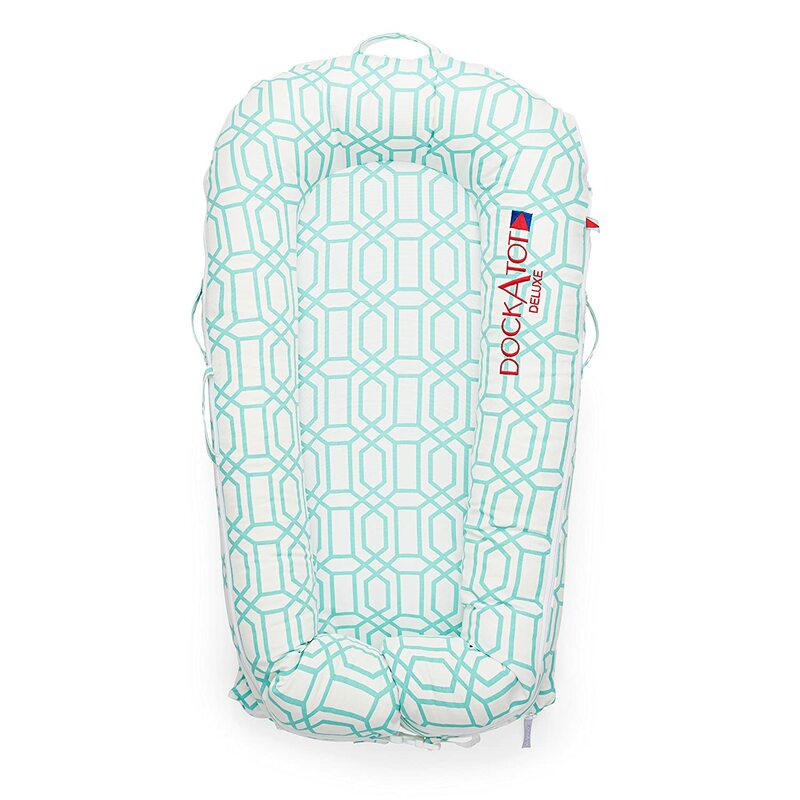 This would be safest without any sleep sacks or sleep suits; if you are going to use one of these, just put your baby to sleep in their pajamas. That’s it for how to stop swaddling your baby! I hope one of these methods works for you. And trust me, all of a sudden one day, you’ll realize that your little one has gotten used to sleeping in their crib and you might not even need to continue using a swaddle transition product. Or, they might start rolling over or moving around, at which point, the products listed above are no longer considered safe because they can constrict baby’s movement in their sleep. Once you’ve hit either milestone, you can switch to using a wearable blanket over your baby’s pajamas. Sleep well! I know you’re probably so so tired, but hopefully you’re managing to get in some self-care.